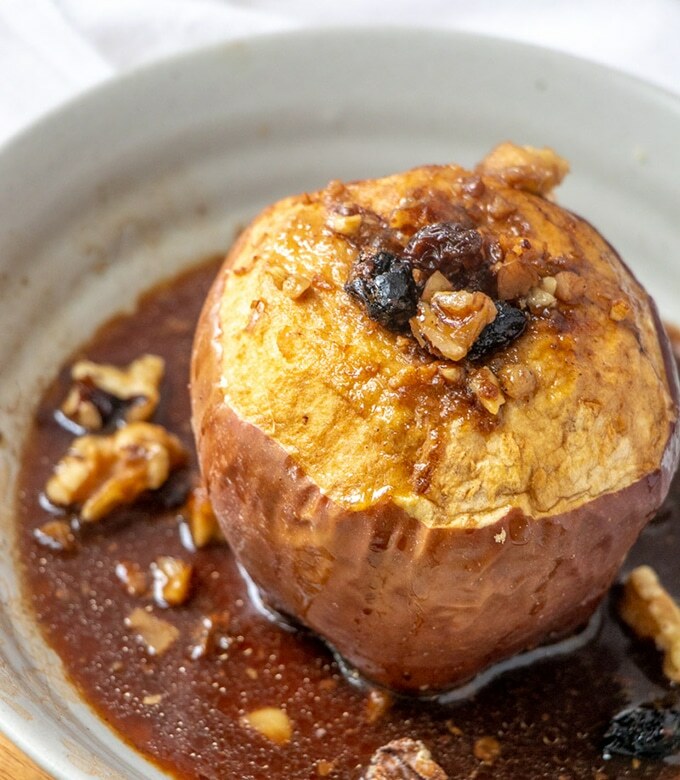 Tea-Baked Apples stuffed with raisins and walnuts and poached in green tea are the ultimate Fall dessert. 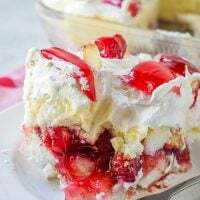 Delicious on they’re own or topped with ice cream! 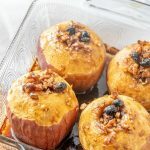 Caramel apples are high on our list of favorite Fall treats at home but for a warm, fruit dessert to cozy up to in chilly weather, baked apples can’t be beaten in my book! 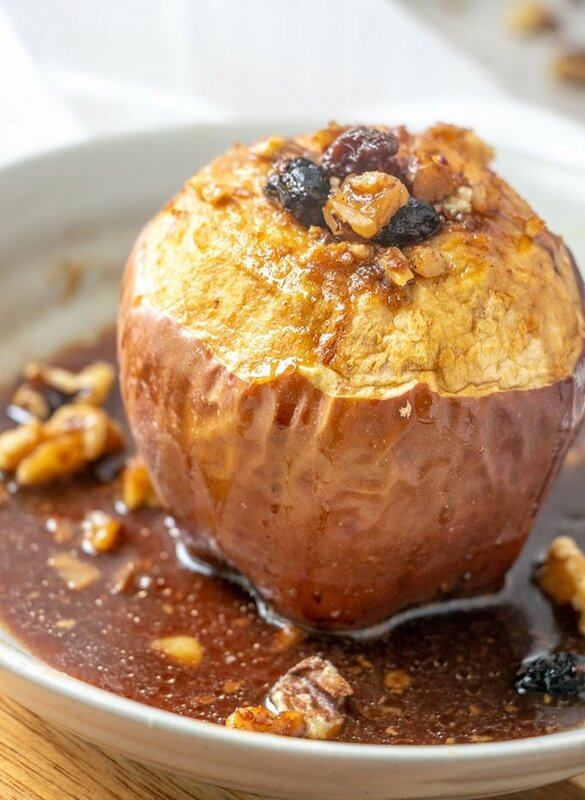 Stuffed with raisins, walnuts, and brown sugar and then poached in green tea, they’re amazing served on their own as well as topped with vanilla ice cream or whipped cream. 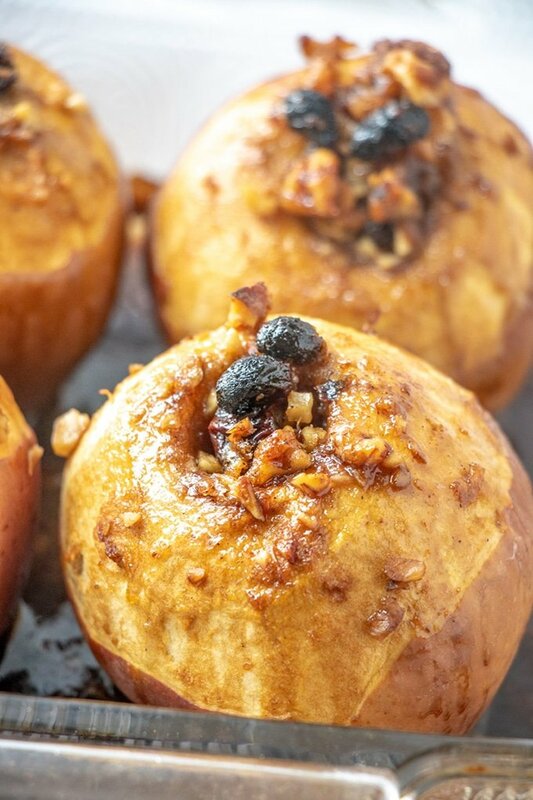 These baked apples are simple to make; they’re ready to enjoy in five easy steps and in an hour. Steep the green tea bags in one cup of hot water. In a bowl, combine butter and brown sugar. 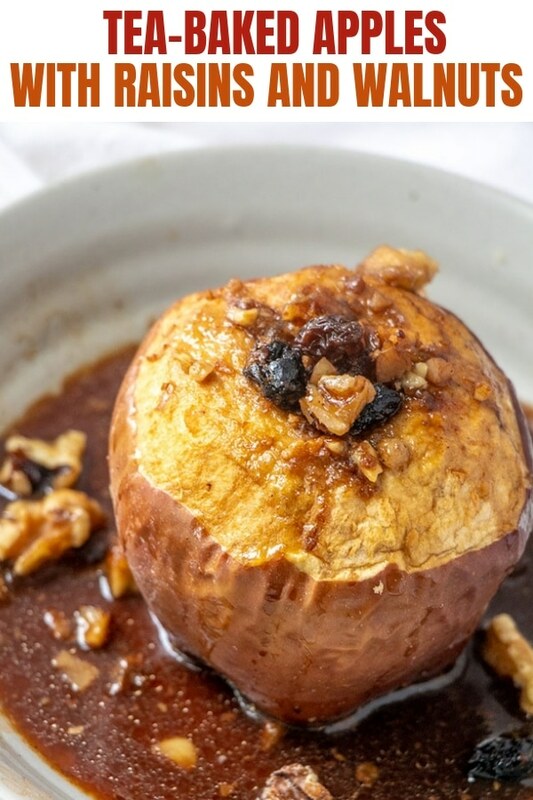 Add the walnuts and raisins. Stuff the mixture into the apples and sprinkle all over top. 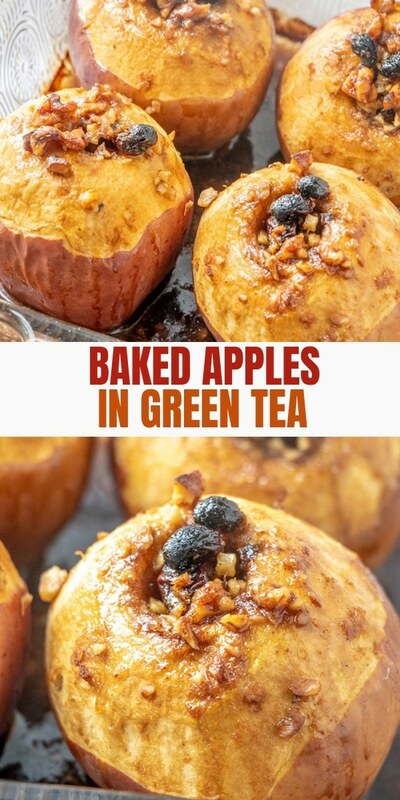 Pour brewed green tea all over and around the apples. 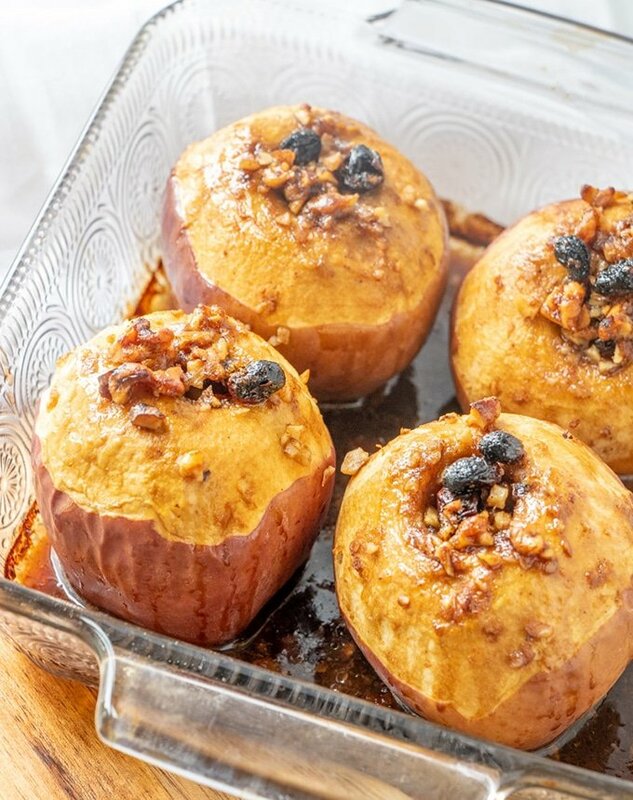 Bake, uncovered and basting occasionally, in a 350 F oven for about 50 to 60 minutes or until apples are tender but not mushy. 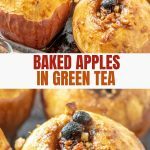 Bake time depends on the size and variety of apples you use. 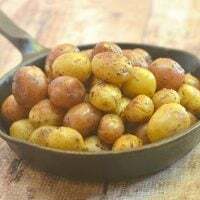 I find 50 to 60 minutes in a 350 F oven makes for a tender but not mushy texture. 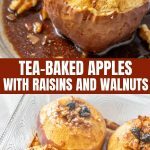 Tea-Baked Apples stuffed with raisins and walnuts and poached in green tea are the ultimate Fall dessert. Delicious on they're own or topped with ice cream! In a saucepan, bring water to a boil. Remove from heat. Add tea bags and brew 1 to 2 minutes. Remove bags from the liquid, squeeze and discard. Using a small paring knife, peel 1/3 top skin of apples and core at about 1 inch wide and leaving the base intact. 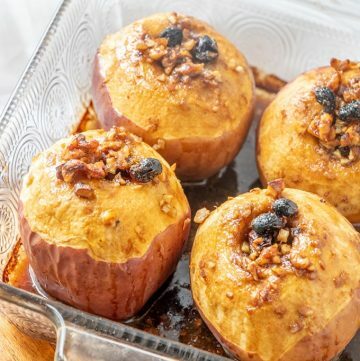 Arrange apples in a single layer with peeled end up in an 8x8 square baking dish. 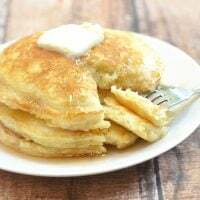 In a small bowl, combine brown sugar, butter, and cinnamon. 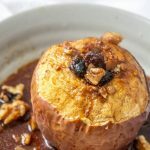 Add walnuts and raisins. 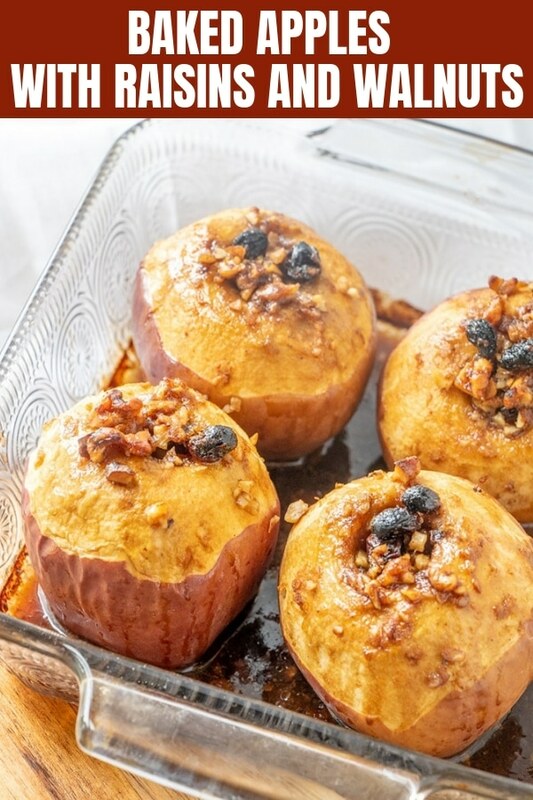 Evenly spoon mixture into center of apples and sprinkle evenly on the top. 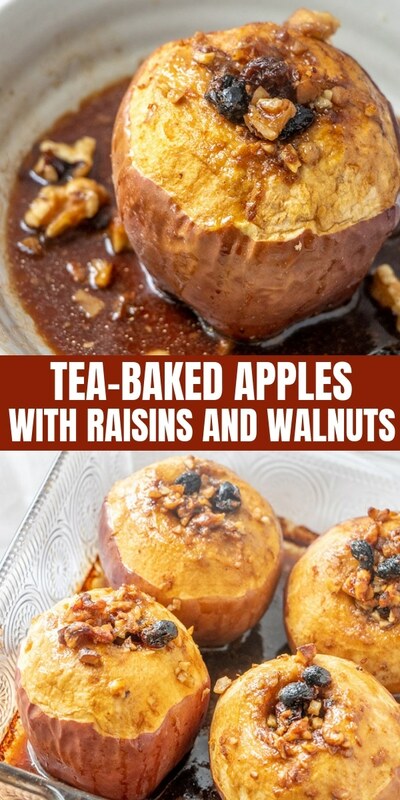 Pour brewed tea over and around apples. 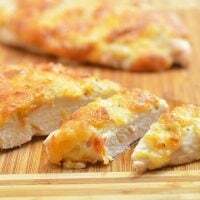 Bake, uncovered and basting occasionally, in a preheated 350 F oven for about 50 to 60 minutes or until tender.